The Evolution of Hair Loss | Robotic Hair Restoration of L.I. Our patients immediately experience the RHRLI Edge. Our board certified surgeon, Baiju Gohil, MD, consults with all of our patients interested in our revolutionary treatment called the ARTAS® System. ARTAS® is a follicular unit extraction hair transplant (FUE) procedure which uses robotic technology to search for healthy donor hairs and transfers them to where they’re needed. Unlike follicular unit transplantation (FUT) procedures which involve scalpels and sutures, ARTAS® is minimally invasive. Most of our patients report little to no pain following the procedure. Robotic Hair Restoration of Long Island can address your evolving hair loss. What Causes Your Hair Loss? There’s no single cause of hair loss, but there is one that is by far the most common. Male pattern hair loss or androgenic alopecia, affects up to 95 percent of men with thinning hair, according to WebMD. Male pattern hair loss can start when you’re young and even in your teens. According to the American Hair Loss Association (AHLA), about 25 percent of men begin to exhibit signs of hair loss by the time they reach the age of 25. The rate of hair loss increases greatly over the next 25 years, as about two thirds of men will experience hair loss by age 35 and 85 percent of men have significantly thinning hair, by age 50. According to the Independent, there are three main areas where hair loss patterns occur. One of these is the temple where hair loss starts at the anterior hairline and begins to move backwards. When this type of hair loss occurs on both temples it can become noticeable as an inverted “W” pattern on the forehead. A second area where pattern hair loss occurs is at the crown at the back of the head. 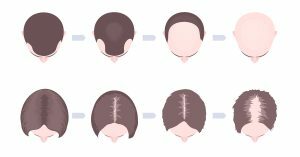 Over time, it will spread outward in all directions to create a circular hair loss pattern that grows larger over time. The third area of thinning can be found over the mid frontal part of the scalp, at the top of the head. The hair loss becomes noticeable when the central part line begins to widen. This is also the mark of female pattern baldness. If your hair loss has evolved past the point where it’s no longer acceptable, RHRLI can help. ARTAS® will help identify healthy donor hair and then transplant it with precision to where it’s needed. You’ll have a healthy new head of hair and a brand new outlook on life. To get started, contact RHRLI today!